This is expected! You must click Continue Anyway to install the driver. 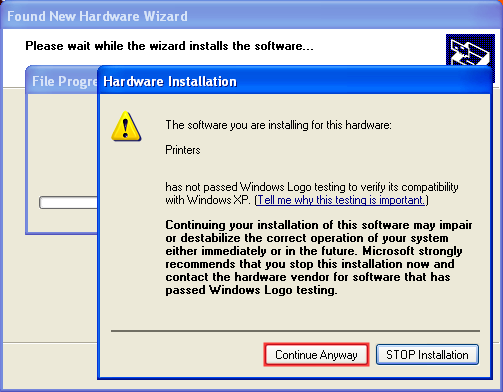 Logo testing is a Microsoft approved testing procedure that requires the software vendor to adhere to certain protocols and pay fees so that the vendor can place the "Designed for Window XP" logo on software packaging. We have chosen not to include this logo on packaging so that we may provide you with software updates faster, more frequently and at a lower price. You can be assured that this software has been thoroughly tested to function properly with Windows XP.